The E-Mobility Challenge competition is run by the Trusted IoT Alliance, the open software consortium created in 2018 to support the creation of a secure, scalable, interoperable, and trusted IoT ecosystem. MachNation, a global independent IoT research and benchmarking firm is co-producing. TIoTA’s members are engaged with linking IoT devices and the companies operating them, and to consumers, service, communication and payment providers. The core concept behind TIoTA is to leverage software advances in cryptography, distributed ledger technology, secure enclaves and other state-of-the-art-approaches to ensure fast and secure trust-building at an unprecedented scale and speed. TIoTA’s members span hardware, communications, payment, logistics, and numerous other tech sectors. TIoTA conceived the E-Mobility Challenge to spur the development and commercialization of the emerging marketplace for e-mobility. The competition will leverage the ecosystem of services that already exists for electric vehicles (EVs) in Europe. The primary vehicle selected for the challenge is a Jaguar I-PACE, provided by Bosch. Participants are invited to work on the I-PACE but can submit entries for any EV. The highlight of the Challenge is the PACE Tour, in which the Jaguar will be available in select European cities for competitors to access, work on their solutions and conduct hackathons. The winning entry will provide the most innovative solution that exemplifies progressive automation and connectivity features by enabling the Jaguar to discover charging stations, pay for electricity, discover additional services, and receive a single invoice at the end. We strongly encourage all entrants to plan a media promotion that tracks all of your Jaguar-related activities for the duration of the PACE Tour. We encourage you to prepare a short presentation that describes your solution, and to have a short demo ready in time for the conclusion of the Challenge which will be staged at Bosch Connected World, May 15th and 16th. Competitors will be required to design and implement their software/hardware systems on the car, on the charger network, and in the cloud. Each entrant will develop an overall reference architecture for their specific solutions. 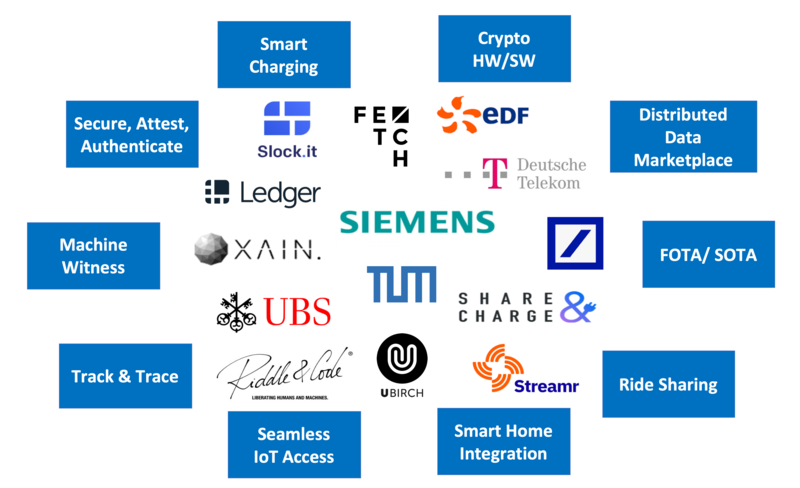 “As the world leader in blockchain infrastructure security, Ledger is proud to be part of the Smart E-Mobility Challenge proposed by the Trusted IoT Alliance. The use case Ledger wants to demonstrate is how to secure, attest and authenticate the data generated by a car and how to securely register it into a blockchain. Ledger’s secure solution will also give capability to the car to exchange green energy with the charging station using blockchain technology. Chief Executive Officer at Ledger. We kicked off the PACE Tour with the beautiful Jaguar I-PACE at the T-Labs Hackathon in Barcelona. 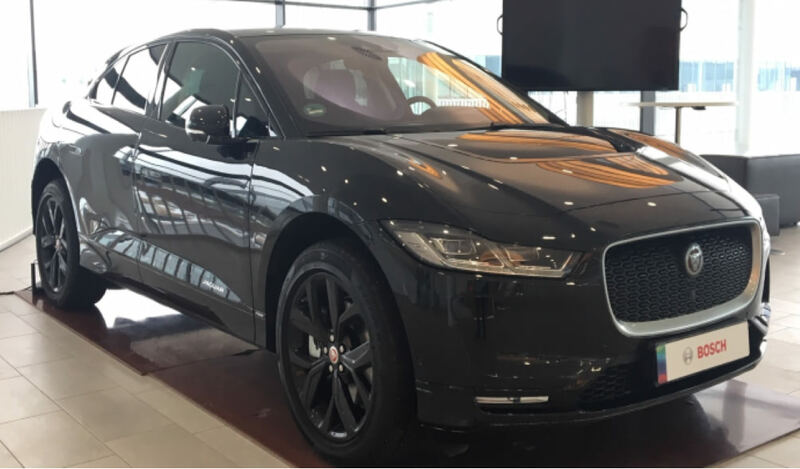 The participants collaborated with the Jaguar I-PACE in Stuttgart for a hackathon, workshop and a presentation by Riddle & Code. 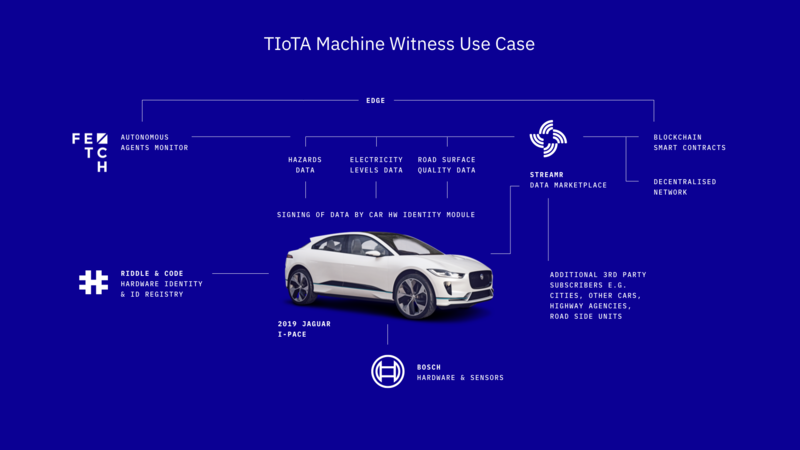 Download the Machine Witness use case model that was presented. Watch the Stuttgart video. You are invited to join us at the IBM Research headquarters in Zurich for a hackathon with the Jaguar I-PACE; presentations by IBM on hyperledger and Streamr on its Challenge Use Case; and a collaborative workshop. Keynote address and announcement of Challenge winners at a press event at Bosch Connected World, Berlin. Does the entry accomplish the following specific goals of the Challenge – a) interoperability, b) ease of use, and c) the ability to pay for electricity on the single invoice? Does the entry advance the marketplace creation by integrating with other service providers along the way, i.e. lodging, food, commerce? Does the entry contribute to the technological design of a trusted ecosystem by proposing and building common software and hardware architectures, standards, reusable components, etc.? Does the project scope include visits to the hackathons or other activities in Europe that could make the Challenge more visible? This might include: stopping by the entrant’s HQ for a demo; meeting the entrant’s team to work on the car or system; or an activity that can help visualize the solution space and make it clearer what TIoTA is about, i.e. bridging the worlds of IoT and DLT/trust systems? Does the technology design and implementation lend itself to a rapid Time-to-Money (TTM)? How quickly can it lead to profits for your company and for the partners? The Jaguar I-PACE resides at a Bosch facility in Stuttgart. The data interchange with the car is accomplished via a device called ALEN — Automotive Linux Edge Node. It resides in the car and will not be made available to the public. It will, however, be available at the hackathons locally. The number one shared task is to build a web gateway for ALEN. Bosch will help with the design specs and provide engineers to build it. Therefore, it will be a requirement for entrants to join the Challenge Working Group, participate in a regular conference call, and work with partners and competitors to define the car capabilities, the charging network entry points, the customer journey connections, and so on. The winning entry will be written up in a public report by MachNation that is publicized by MachNation and TIoTA. The winner will have the opportunity to propose a PoC to the members of TIoTA and the sponsors of the Challenge. An “Open Innovation” award will recognize an innovative DLT IoT solution that shows originality in its technology or market approach. The “Collaboration Award” will honor the best team submission. Monetary or token prizes will become available as sponsorships are lined up. We will keep the participants appraised. The judges will consist of recognized authorities in the field from the TIoTA executive team, members, sponsors, and invited experts. MachNation, a recognized analyst firm with its own unique IoT benchmark labs, will also provide a judge and will publish a report that describes the winning entries. Thank you for entering the Smart E-Mobility Challenge! We are looking forward to working with you over the next few months. This slide deck, entitled Smart E-Mobility Criteria and Context, provides updated resources and important data points for you. As always, please don't hesitate to contact us with questions.